I’m a Brisbane local through and through. I was born here, grew up here, and though I’ve traveled the world, I think I’ll always call Brisbane “home”. Brisbane has just about everything that you could want; the convenience and variety of a big city, friendly locals and easy access to great beaches, rainforest and country scenery. There are so many things to do in Brisbane, but if you’ve only got limited time (i.e. a weekend stopover), here are some of the best things I’d recommend. Rather than a set itinerary, I’ve listed lots of things that you can pick and choose from to create your own adventure to suit your taste, budget and weather! 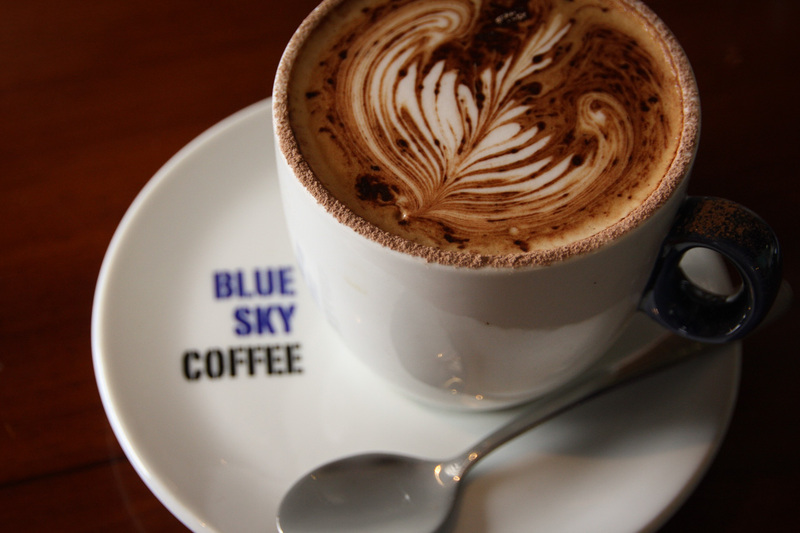 Start your mornings by sampling the finest beans at some of Brisbane’s best coffee spots. Some people will tell you that Melbourne‘s the coffee capital of Australia, but Brisbane is quickly catching up with lots of specialist roasters and hidden lane way cafes. If you’re looking for something yummy for breakfast, you can’t go past the Gunshop Café at West End or Sassafrass at Paddington. 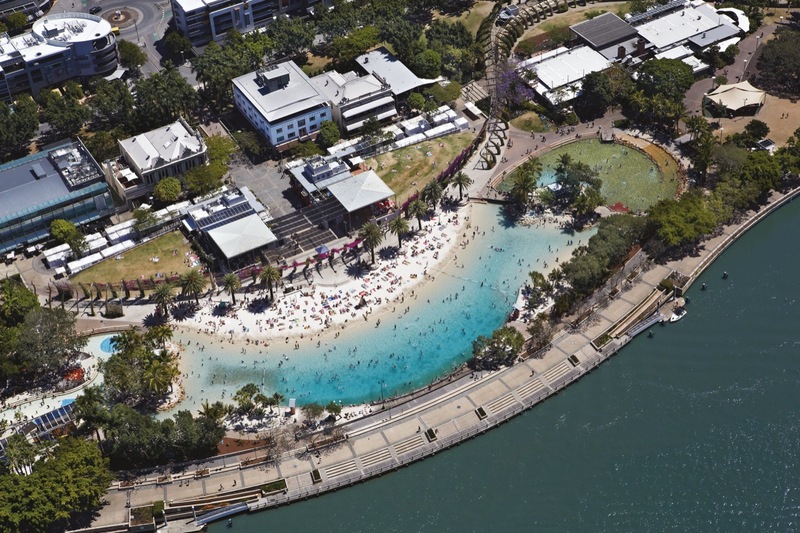 Take a stroll along the river at South Bank parklands to work off your breakfast, then go for a dip at the artificial beach. Yep, that’s right – we have a beach in the middle of our city! There’s plenty of stuff to do around South Bank with lots of cafés, restaurants and bars if you need to top up. 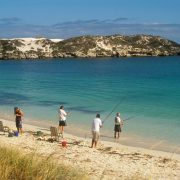 There are also plenty of outdoor barbecue areas and it’s a great place to catch up with friends while the kids have a swim. At South Bank you can also find the old IMAX cinema, which now shows all the latest Hollywood blockbusters on the massive 25 metre cinemascope screen! 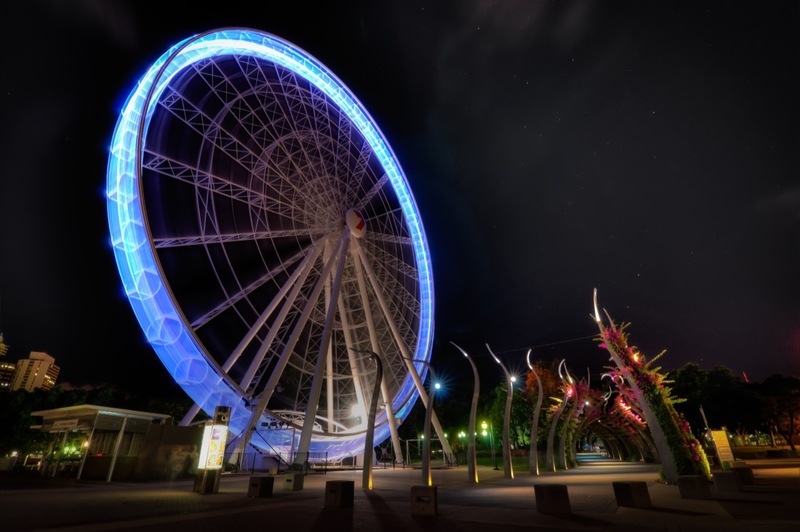 Another recent feature at South Bank is the Wheel of Brisbane – a 60 metre Ferris wheel with enclosed pods that give great views of the city, especially at night. Parking at South Bank can be a little expensive (there is an underground car park), but it’s easily accessible by bus (Cultural Centre bus station) and train (South Bank or South Brisbane stations). 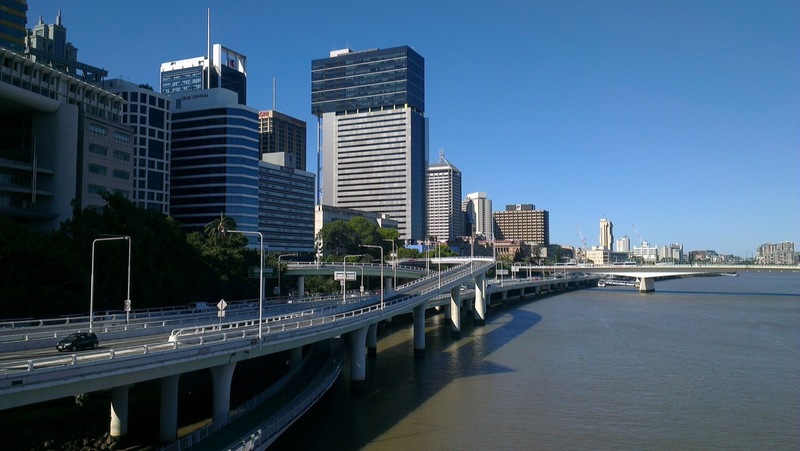 South Bank is also in close proximity to Brisbane’s cultural precinct, featuring QPAC (Queensland Performing Arts Centre), the Queensland Museum, Sciencentre, State Library, Art Gallery and GoMA (Gallery of Modern Art). There are often excellent exhibitions on display at these institutions, and the museum is a great way to learn about Brisbane and Queensland’s history. There’s plenty to see and do in the centre of town as well. One of the best ways to get an idea of what’s around is to hop on the CitySights bus, operated by the City Council. The hop-on/hop-off service is well worth the money and your ticket also includes travel on any CityCat service. See the CitySights website for a full list of stops. Catching a CityCat (the blue and yellow catamarans that run up and down the Brisbane River) is one of the best ways to see the city’s riverside attractions. 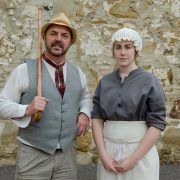 Or explore the city centre with one of the free guided walks run from the visitor information centre in the mall. 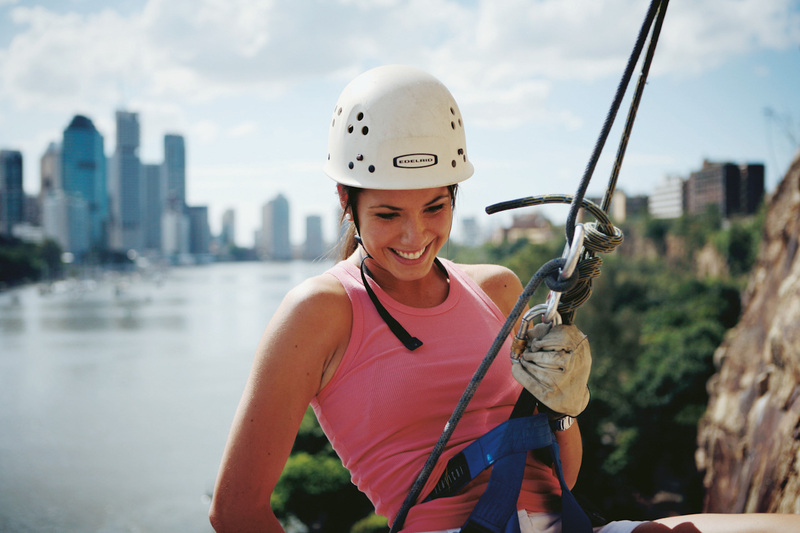 Explore Kangaroo Point, including the Riverlife Adventure Centre. If you want to try abseiling or rock climbing, this is the place for you. 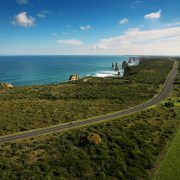 The 18 metre high cliffs feature routes for climbers of all levels. If climbing isn’t for you, then perhaps a quiet paddle on the river is more suited. Or simply walk along the banks and take in the fresh air. At the top of the cliffs is the newly redeveloped Kangaroo Point Parklands and Cliffs Café – a great spot to unwind and take in stunning views of the city skyline. Sydney may have started the bridge climb phenomenon, but we have our very own bridge climb on the Story Bridge. What better way to see the city sights than from 80 metres up! If you’re feeling extra adventurous, you can even abseil back down. I’d recommend rewarding yourself with a steak and beer from the iconic Story Bridge Hotel. Or take a brewery tour at another Brisbane icon – the XXXX brewery. Let’s face it – lots of people come to Australia to get up close and personal with our unique wildlife. Most of our animals will kill you, but a few are cute and cuddly. The most famous zoo around Brisbane is Australia Zoo – made famous by Steve Irwin. The zoo is about an hour from Brisbane city, and features all sorts of animal encounters. There are plenty of other animal attractions around Brisbane, though. Check out the following for more animal-filled fun: Alma Park Zoo, David Fleay Wildlife Park, South-East Queensland Wildlife Centre, Lone Pine Koala Sanctuary and the Daisy Hill Koala Centre. Both Paddington and West End have plenty of little shops where you can stroll around after breakfast to find unique gifts and wares, as well as the West End markets on Saturdays. If you’re into markets, don’t miss the South Bank markets, Carrara Markets or Jan Power’s Farmers Markets on each Saturday, or the Eagle Farm markets, Young Designers Market and Nundah Farmers’ Markets on Sundays. The Eumundi Markets are some of the best around if you feel like taking a bit of a drive out of town. Brisbane is one of the greenest cities in Australia, with plenty of lush parks and gardens to stroll through. The city Botanic Gardens are a great place to take a walk at any time, either by foot or on bicycle. There are paths that run right along the river, and plenty of cycleways that link up. You can hire bikes in the gardens on weekends, or use the yellow CityCycles that are conveniently located throughout the city. New Farm Park and the Roma Street Parklands are also worth exploring, each with plenty of things to see and do. Mount Coot-tha has its own botanic gardens, including a cactus house, bonsai house, fern house, Japanese garden and tropial display dome. At Mount Coot-tha you’ll also find the recently refurbished Sir Thomas Brisbane Planetarium which is great for kids and adults alike. After exploring these places, head up to the lookout at the top of the mountain for a great view of the city (best enjoyed with ice cream and hot chocolate)! If you prefer the water, head out to Manly and Wynnum to explore Brisbane’s Bayside for a stroll along the water (and be sure to stop off at Chidos for the best Mexican food in Brisbane in my opinion). Brisbane is blessed with some of the best weather around. It’s usually quite warm, with sunny days and moderate nights. 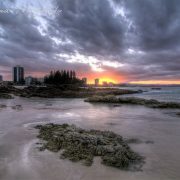 It’s no wonder, when Brisbane is the capital of Queensland – the “Sunshine State”! In the event that you do encounter some rainy weather, there are plenty of indoor activities too! Here’s the weather forecast for the next few days.